Irish Life Health All-Ireland Schools Combined Events took place in Athlone last Saturday. Saidhbhe Byrne of Coláiste Bríd took a fantastic silver in Minor Girls. Saidhbhe, who had recently been afflicted with a lung infection, may not have been firing on all cylinders but she still managed to rack up 2890 points. She ran 9.77s for 60m Hurdles, got the Shot out to 10.56m, cleared 1.47m in High Jump, leaped 4.54m in Long Jump and ran 2.42.76 mins for 800m. 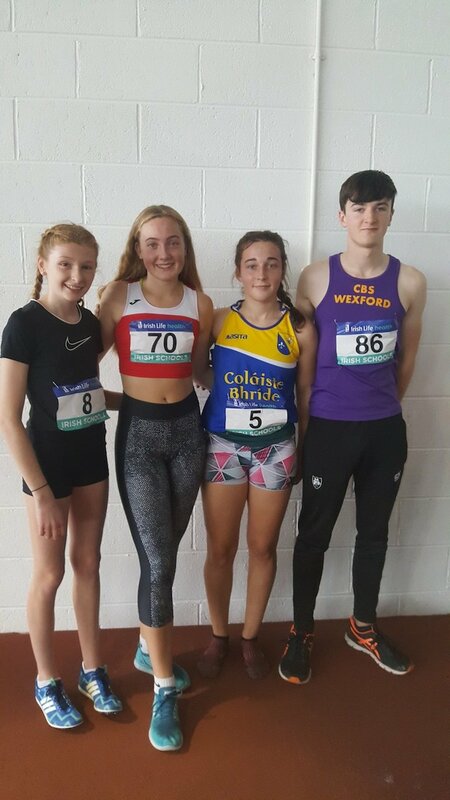 Orlaith Deegan (FCJ Bunclody) finished in 4th place in Minor Girls on 2673 points having achieved PBs in High Jump (1.53m) and Long Jump (4.40m). She also had the third fastest 800m time (2.32.43 mins). Maeve Hayes (Loreto Wexford) placed 4th in the Inter Girls on 3103 points. She had the joint best result in High Jump (1.59m) and she performed with great consistency across the remaining events. The upshot of this is that Maeve gets to compete in her first international as she automatically makes the Irish team for the Schools International which take place next month in Glasgow. Jack Forde (Wexford CBS) placed 6th in Inter Boys with 2920 points. He was very pleased with his placing as he still has another year in this category.